Ex Cops performs at the Meyer Theatre in downtown Green Bay as part of the Near Water Concert Series. To say the Near Water Concert Series is a step towards saving Green Bay’s music scene isn’t too far of a jump. A city which usually hosts chart-topping country and faded rock acts is now welcoming a tidal wave of Grammy nominated and emerging artists. The Lumineers stand out among the five performances the Near Water Concert Series has hosted at the Meyer Theatre in downtown Green Bay. In my experience, it’s been hard for an emerging act to rev up a Green Bay crowd without jumping into a GO PACK GO! chant. (Such was the case with Fitz and the Tantrums at the now defunct Bayfest). However, The Lumineers brought both a powerful songbook and a contagious energy that roused the audience. It’s that enthusiasm that has pushed the darlings of the folk scene to the top of the charts and brought them such high accolades as Grammy nominations for Best New Artist and Best Americana Album. 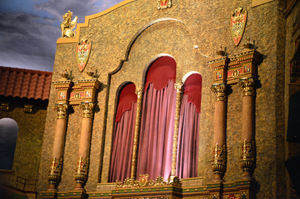 A look at one of the many uniquely beautiful features of the Meyer Theatre. The Near Water Concert Series isn’t only bringing top-notch acts to an awe-inspiring venue, it’s doing so at a very reasonable price. Why drive to Milwaukee’s Turner Hall Ballroom for a show when you can see the same show practically in your own backyard? For $10 to $15 a show, you can see many of the same acts and still sleep in your own bed at the end of the night. One of the acts which has played both the Meyer and Turner Hall recently is the Wisconsin-based band Field Report. The band’s lead singer, Christopher Porterfield, originally played with Justin Vernon (Bon Iver) in Eau Claire’s DeYarmond Edison. One of the more recent shows was headlined by the Brooklyn band Ex Cops. Their set was solid, albeit brief. Their album clocks in at just under thirty-two minutes, so they really couldn’t be expected to play much longer than that. However, I wasn’t the only person at the concert wondering why the house lights came on so soon. Ex Cops was outshone and outplayed by their opening band. PHOX, another homegrown act hailing from Baraboo, Wisconsin, put on a phenomenal performance. One of the highlights of the show was when four of the band members came to the very edge of the stage to sing a very poignant a capella tune. The Near Water Concert Series has yet to announce its next act. But keep an eye on Near Water’s Facebook page for future announcements, as well as near daily posts about other emerging and established indie bands. And if you liked this story, LIKE WHOONEW ON FACEBOOK! We’ve got many more interesting articles about life in Northeast Wisconsin coming your way soon. You can also subscribe by email so you’ll never miss anything. You forgot to add Fort Frances on our November 7 show! Good catch Tim. We’ve updated our article and playlist to include Fort Frances. 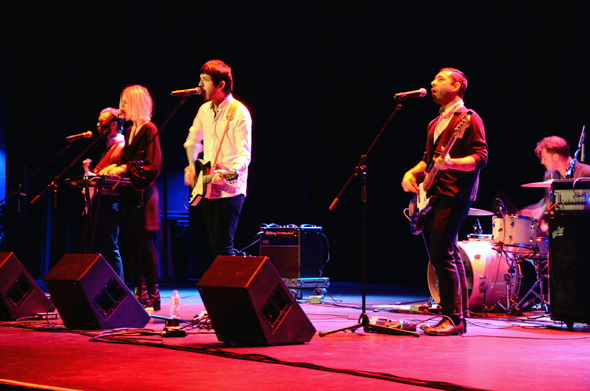 Grace Potter and the Nocturnals and Trampled by Turtles recently played The Meyer, also. They are both gettting pretty popular. Missed the Turtles, but Grace sure RocKed!! The Meyer and PMI Entertainment are bringing a ton of great acts to Green Bay. Bravo to good music in Titletown!